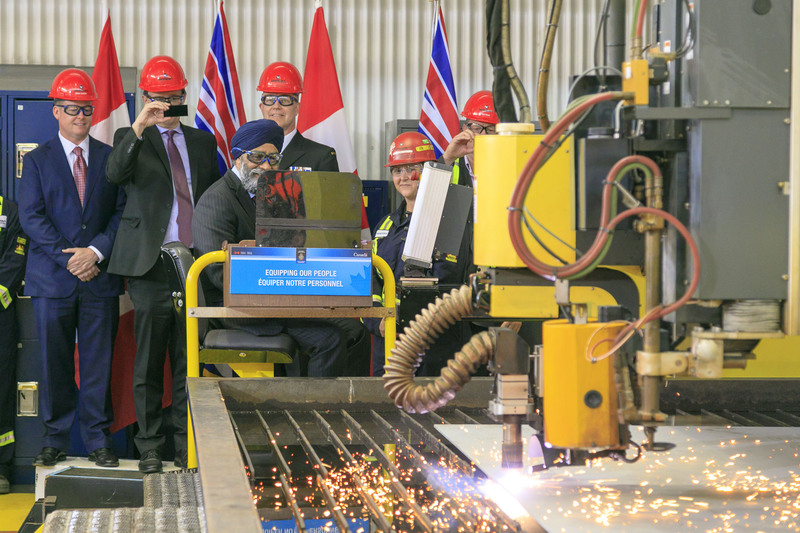 On Friday, June 15, the Honourable Harjit Sajjan, Minister of National Defence, observes as the steel is cut for the Royal Canadian Navy’s first Joint Support Ship (JSS), to be built at Seaspan Shipyards in North Vancouver, BC. Once completed, the two ships, to be named HMCS Protecteur and HMCS Preserver, will be more than 173 metres in length and with a design displacement of nearly 20,000 tonnes. They will have the capacity to support the RCN’s domestic and deployed operations, including humanitarian missions. These ships will deliver fuel and other vital supplies to vessels at sea, offer modern medical and dental facilities, and provide support for helicopter operations and equipment repair.